Digging is an important part of playing defense. The goal of digging is to prevent the ball from hitting the floor when the opponent is attacking. A successful dig is controlled and directed to a target, usually the setter. When a ball is dug accurately, the offense has a better chance of setting up a return attack and scoring a point. Keep your knees bent and your feet wide apart, ready to move in any direction. Remain in a low stance and keep your weight on your toes. Bend at the waist and lean forward with your shoulders over your knees. Keep your arms bent and out in front of your body. A good defender will watch the hitter and anticipate where the ball will be hit. It is best to face the hitter and be prepared to dig the ball at the mid-line of your body. The dig will be more controlled if your stance is in a position to receive the ball low and between the legs. If possible, a dig should be performed with both hands and arms, keeping a straight platform and angling in the direction of the target. The angling motion may also incorporate rotating your shoulders and arms in a clockwise or counter-clockwise motion in order to receive an attack where the trajectory is to the left or to the right of your stance. Try to avoid swinging your arms when you are digging. A hard driven ball, in most cases, will only need a small amount of upward movement in the direction of the target area. Front row blockers typically defend traditional left, right and middle attacks at the net. 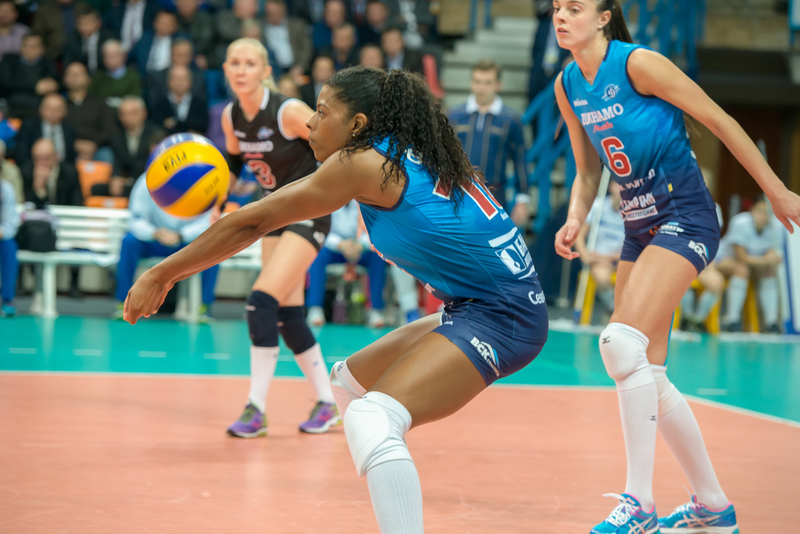 Back row attacks tend to bring all blockers off the net and into a pass or dig receive stance. Its a common practice for defenders in the back row to coordinate their ready position with the block. If it appears that left and right blockers will be attempting to block a perceived angled attack, then defenders in the back row should be dig ready for the attackers possible down the line trajectory. Middle back defenders will usually pull up to the ten foot line to cover angled off the block attacks or a dink (over the block tap). If left and right blockers take away the line attack option and force the angle attack, then defenders should adjust court positioning and receive stance again to cover the direct open angle attack and possible off the block and dink scenarios. Good communication between front and back row defenders as well as attack awareness are critical components of an effective and successful defense. 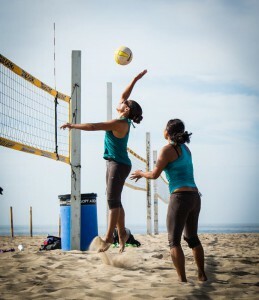 In the photo below, note that the outside hitter is most likely going for the angle attack. With two blockers up, three defenders on the right side of the court are in the ready position and spaced far enough apart to dig any variation of a hard driven angle attack if it gets past the block. The defender behind the blockers appears to be anticipating an off the block or through the gap in the block hit. After a successful dig or defensive pass all players should be in the ready position for offense or defensive coverage.